Trick and trump your way to winning-but beware of the Rook! A trick taking game. Functionally it is a deck of cards with an extra in each “suit”. 1-14 in four colors plus the Rook. You start out bidding how many points you can win (5, 10, 14, and Rook cards score points). The winning bid declares what color is trump. Then you start playing tricks trying to score points. The bid winner tries to claim points totaling at least the bid, the other players try to prevent this, of course. It is simple to pick up. Replay value is going to vary person to person; it’s either your kind of game, or it isn’t. I can enjoy it, but I really don’t want to play this one with my in-laws. To them it is a tradition, and they take it far too seriously. Some games are classics because they’ve been around forever, like Monopoly (no comment) or Chutes and Ladders (again, no comment). Rook is a classic because it plays well after hundreds of games, like euchre and cribbage. The rules can be a bit off-putting because they get muddled with variations. I suggest you just drop the cards below 5 and focus on the basic rules. Also, be sure to play the 4-person rules, with partners. Despite classifying myself as an avid gamer, I will take Rook over almost any other game every single time. 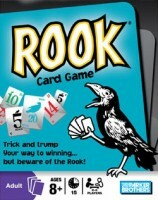 Yes, Rook *is* a trick taking game, but the strategy goes significantly further than other games like Hearts or Spades. In Rook, the strategy is all about reading your partner and playing to their strengths and weaknesses. Add a Review for "ROOK"